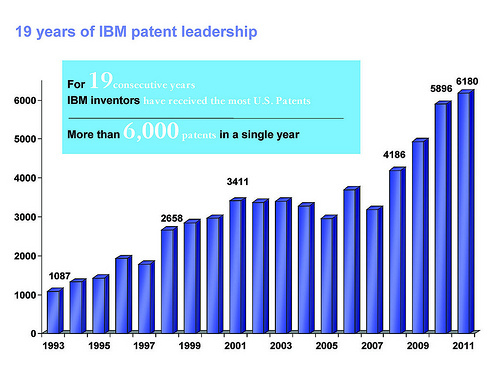 At this point, IBM’s annual patent leadership is almost a bit of a yawner. IBM announced today it set a new U.S. patent record in 2011, marking the 19th consecutive year that the company has led the annual list of patent recipients. IBM inventors earned a record 6,180 U.S. patents in 2011, more than quadrupling Hewlett-Packard’s issuances and exceeding by six times those of Oracle/Sun. You know, the awe-inspiring, intellectual property-excited kind of yawn. I say that, because IBM announced it set a new U.S. patent record in 2011, marketing the 19th consecutive year the company has led the annual list of patent recipients. IBM inventors earned a record 6,180 U.S. patents in 2011, more than quadrupling Hewlett-Packard’s issuances and exceeding by six times those of Oracle/Sun. Averaged out, that’s 16.93 patents per day! In 2011, more than 8,000 IBMers residing in 46 different U.S. States and 36 countries were responsible for the company’s record-breaking 2011 patent tally. IBM inventors who reside outside the U.S. contributed to more than 26% of the company’s 2011 patents. The more than 6,000 patents IBMers received in 2011 represent a range of inventions that enable new innovations and add significant value to the company’s products, services, including smarter solutions for retail, banking, healthcare, transportation and other industries. These patented inventions also span a wide range of computing technologies poised to support a new generation of more cognitive, intelligent and insight-driven systems, processes and infrastructures for smarter commerce, shopping, medicine, transportation, and more. So Scott and I recorded our latest “TurboTech” episode yesterday, and no sooner did we record the bit about Meg Whitman maybe taking over as CEO of HP than it seems like it’s actually gonna be a done deal. That’s okay, things move fast in this industry, and it’s kind of like that old joke about how you don’t have to outrun the leopard — you just have to outrun the slowest gazelle. In this case, I’m not sure if Scott’s the gazelle and I’m the leopard, or if Meg Whitman’s the leopard and Leo Apotheker’s the gazelle, but whatever the case, things change, watch us move your cheese. We talked about that, the Netflix marketing debacle, and the latest changes on Facebook (which pretty much everyone seems to hate). Me, I’m off to India tomorrow, and will be hanging in the IT hub of Bangalore for a week. I hope to take lots of pics and NOT lose my camera there this go around, and am very much looking forward to some of that lovely South and North India Cuisine and to seeing all my IBM India friends. Put some Kingfishers on ice, gang, I’ll be there momentarily. Enjoy this episode, and the next dispatch may just be a video one from the streets of Bangalore, where crossing through traffic’s like riding in a sub-contintental rodeo with motor rickshaws and motorbikes! This has been a crazy Friday, so I didn’t have much time to blog. But, Scott Laningham and I were able to cut our first developerWorks “videopodcast,” where we covered some of the major recent IT and tech news, including the announcement of Steve Jobs resignation (I apologize in advance for saying his name both ways! ), HP/Autonomy deal, Google/Motorola, and even a few bits on my 20th anniversary with Big Blue. For those of you in the path of Irene, please be safe and heed all the warnings of your public officials. We’ll be thinking about you all along the East Coast down here in drought-laden Texas. We need some rain, but we prefer it not come in the form of a hurricane (although I’m sure some farmers in South Texas might argue with me about now). Here in Austin, the forecast has us at around 109 degrees Fahrenheit tomorrow. Yikes! You can certainly count on one of two things when I’m traveling overseas, particularly in Asia. There will either be a natural disaster in the vicinity, or a major tech acquisition. In May 2008 in a trip to Beijing, it was both: I felt the tremors on the far outskirts of the Sichuan quake in China, and HP announced it’s intent to acquire EDS. Today, while in Sydney, though the real ground isn’t quaking, there was an announcement that HP intended to acquire Palm for $1.2B. TechCrunch’s MG Siegler suggests the move’s not so much for the hardware, but rather to gain access to Palm’s 1,500+ patents and its webOS, which HP will be able to use in its own slate and mobile operations. Also, check out ReadWriteWeb’s “smartest tweets” already emerging on this deal. Whether or not the acquisition will give HP a mobile hand up remains to be seen, but anything that provides a countervailing force to Apple’s iPhone juggernaut and the gaining momentum of the Google Android is probably a good thing. Meanwhile, back at the IBM mobile computing ranch, I’ll remind you of the strong hand that’s been emerging out of Lotus on this front. To learn more about IBM Lotus mobility solutions, you can sign up for this webcast series.